The Liaison Group of the European Economic and Social Committee (EESC) has set to work on an ambitious programme aiming to improve dialogue and collaboration between European institutions and organised civil society after its role being revamped in 2011. On 7th March a meeting was held to allow the European organisations members of Liaison Group to discuss on priority themes and prepare some of the planned initiatives. The first part of the meeting was dedicated to the preparation of a Civil society day 2012 in May, an event which will be jointly organised by the Economic and social committee (EESC) and the Liaison Group. The programme, now still at the stage of a draft, will include two sessions and three workshops about participation of civil society in decision-making processes in light also of the current crisis and on how to implement article 11 of the TEU. Difficult meeting on 2012 convention of the Platform against Poverty. One of five headline targets in the Europe 2020 strategy for “smart”, sustainable, and inclusive growth is for the 27 EU member states together to lift 20 million people out of poverty. The “European Platform Against Poverty” (EPAP) is a key plank in the EU’s struggle to achieve this target, although it remains a vaguely defined initiative. A first annual convention of the EPAP was held in Krakow in October last year. But many participants in stakeholders in the meeting were disappointed by the way it was organised and the quality of the discussion that was possible. Given that this is a major high profile event which is time consuming and expensive to organise, many stakeholders are demanding more from the commission in future years. - there had been a lack of feeling of shared ownership - the Commission had found it difficult to make all stakeholders feel included and they intended to remedy this from now on. - the whole affair had been prepared in too much of a rush, and this year will be prepared well in advance. The Liaison Group of the EESC has written an open letter to the members of the European Parliament, calling on them to ensure that the Year, which was proposed in August last year, will have the scope to really address the many important issues linked to citizenship of the EU. The letter recalls that democratic citizenship implies that citizens have a say in the EU policy-shaping and decision-making processes by electing their representatives to the European Parliament. With the prospect of the upcoming elections in 2014 and at a time when many citizens feel the European Union is remote from their concerns, the stakes could not be higher. The signatory organisations believe that the European institutions' difficulties to give a strong and coordinated political and institutional response to the current financial, economic and social crisis and the mounting predominance of the use of intergovernmental method in European processes can partly account for this civic disaffection towards the EU. To read the full text of the letter you can download it here. Do not hesitate to circulate it to people or organisations who may be interested. The latest meeting of the European Parliament’s Public Services Intergroup on 1 February focused on the topic : Not-for-profit organisations and State Aid. Invited speakers included Conny Reuter, Secretary General of Solidar and current president of the Social Platform; Katharina Wegner, of the German organisation Diakonie as well as a speaker representing the European Commission DG Competition. Issues arising within local governments (collectivités territoriales) in their relations with associations providing social services have made clear the need for a debate on this topic. On one hand the local authority takes on the role of client, ordering services from the provider. On the other hand, social services have a very particular role in society responding to social needs and challenges often addressing vulnerable demographic groups. This aspect changes the relationship from a simple client-provider one, because it introduces philosophical questions about how the service should be provided and to what end. For many working in the sector it is clear that the debate is not about how to organise competition to make the sector more profitable, since many social services are by their very nature unprofitable if they are provided to the adequate standards of quality. The Annual Growth Survey for 2012 was presented by the European Commission in November 2011 – its main message is that member states are not doing enough to achieve the targets they committed to under the Europe 2020 strategy. A key part of the strategy is the National Reform Programme which each country’s government must produce each year, telling what measures are being taken to achieve the targets. These reports must be prepared in consultation with all interested stakeholders, which of course includes the NGO community. However, assessments about the inclusion in the first set of NRPs was disappointing, and many governments consult very selectively and restrict the more open aspects to information-giving, without much or any opportunity to let the proposals expressed find their way into the finished document. 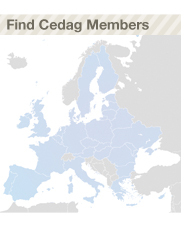 What actions are CEDAG members taking to have their views considered in the National Reform Programmes?